When the time comes to have new roofing installed on your home, you have two options — something simple or something unique. In many cases, the latter option can add significant value to your home. One of the foremost options in this regard is the Cotswold cottage roof, which can give homes in any location a taste of the Old World. What Is a Cotswold Cottage? A Cotswold cottage is any house with an exterior inspired by the architectural style of the classic homes in the Cotswold Hills of southwest England. Cotswold houses have a picturesque and cozy look that recalls the charm of old England, long before the technological advances that led to the spread of modernism in architecture. Cotswold cottages range in size and layout, but most share select hallmarks of old English style. The outside walls are often covered in stone, in colors such as rust, sand, gold and ivory. Cotswold homes feature prominent windows along the first floor, as well as gabled windows along the eaves of the roof. The majority of Cotswold cottages have chimneys, as well as adjoining gated fences and garages. The outer walls of Cotswold houses are typically lined with green growth, which blends into the surrounding trees, lawns and trimmings. The overall green surroundings of the Cotswold home are indicative of the English rural origins of the cottages of this style. The Cotswold cottage comes from a long line of Old World tradition that survives to this day because of its unique character and charm. Even though styles in home design have gone through many changes over the past 100 years, homeowners keep returning to classic looks like the Cotswold and Carmel cottage styles. As many would argue, homes in these styles are much more distinctive and visually engaging than the more conventional, square designs of the typical American suburb. The most unique aspect of these homes is the Cotswold cottage roof, on which the shingles have a warped and bubbled appearance. Made from heat-treated wood, the shingles that comprise the Cotswold house roof give homes a quaint and somewhat animated appearance, which help evoke the precious times of the Old World. The thick, curvy, distinctive shingles of the Cotswold roof often go over the gables of the windows and doorways, in addition to the roofs. Cotswold homes generally have higher value on the market. As such, more homeowners have chosen to convert their exteriors with designs reminiscent of the Cotswold cottage, complete with the thick, wavy shingles that serve as the visual hallmark of the style. While the look can take a lot of work to achieve, a Cotswold cottage roof contractor can make it happen for homes in any community. Even if you live in the United States, you too can have a house that evokes the rustic charms of old England with a Cotswold cottage roof installation. What Makes Cotswold Cottage Roofs Unique? Thickness: Country cottage roof designs of the Cotswold style are unique because of the shape and thickness of the shingles, which give homes a decidedly animated appearance. With their wavy rows and puffy outlines, the shingles on Cotswold cottage roofs have been described as surreal and even toy-like. From a distance, houses topped with Cotswold roofing resemble giant mushrooms or, alternately, gingerbread houses topped with thick layers of frosting. Curvature: The key element to the uniqueness of Cotswold-style roofs are the heat-treated wooden shingles, which are warped to a curvature, cut with rounded edges and stacked along eaves to a blanket-like thickness. As you follow the lines from one side of a Cotswold roof to the other, you'll often notice wavy lines running across. In a sense, the Cotswold roof is like an impressionistic take on the conventional roof, and therein lies its charm. Layers: The puffiness of Cotswold shingles is due to the way they are stacked in layers along the eaves of roofs and gables. Along the edges of roofs in this style, you can see the rounded stack-ups of multiple layers of shingles, which pour over the edges of Cotswold cottages. Dropped edges: Many homes that sport this type of roofing also have the shingles drooping over the edges of attic-window gables. Some homes even have the shingles spilling just above first-floor windows, both square and round. When the puffy edges of the Cotswold stacked shingles rest above round windows, the appearance evokes that of a sleepy eyelid. Colors: Cotswold cottage roofs are available in a variety of colors. While the majority of homes that sport this roofing style have used conventional wood tones like maple, Cotswold shingles also exist in colors such as off-white, brick red, forest green and navy blue. There are even homes that sport Cotswold shingles in multiple hues, where maple shingles alternate with brick-red and forest-green varieties — a mix that creates an effect akin to autumn leaves. Diversity: A country cottage roof contractor can apply this look to houses of all sizes and layouts. Even a house built in recent decades can be transformed into the unique Cotswold style with a country cottage roof installation. To onlookers, guests and future homebuyers, country cottage roofing styles serve as eye magnets. As such, a home with an English cottage roof, whether new or old, will generally command high value on the real estate market. Thank you -- We look forward to assisting you! A roof is more than just something that keeps you safe and dry — it’s something that can also greatly improve or change the appearance of your home. Too often, homeowners think of their roof as a part of their property that’s merely functional, rather than one that contributes to its curb appeal. At Custom Shingles, we encourage our customers to rethink what a roof can be. Take a look at the Cotswold cottage in our blog or visit our Portfolio Gallery to see some of the ways we can incorporate the design characteristics of a traditional English cottage into your home. 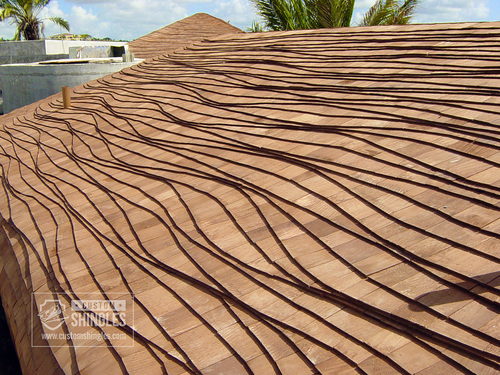 You’ll be amazed at the dramatic effect our curved, custom-cut wood shingles can have on any property. To request a free quote, get in touch with our office by phone or email. The aesthetic elements of Cotswold roofs complement their heritage, which often means homeowners are interested in these roof systems because they want to achieve this specific look and feel. Visual appeal: One of the foremost benefits of a Cotswold or Carmel cottage roof is the visual appeal such styles add to homes. People like the look of roofs in styles such as Cotswold because the shingles can make any house stand out from its surroundings. Whether a house is in the suburbs or deep in the countryside, Cotswold and Carmel roofs are complementary to the surrounding trees and greenery. Uniqueness: Homeowners also like Cotswold shingles because of the uniqueness of such roofing. Simply put, the Cotswold style roof is like no other roofing option in the world. Whereas most shingles are designed to reinforce the eaves with flat, tapered layers, Cotswold shingles provide a "foaming-roof" effect that people notice and remember. 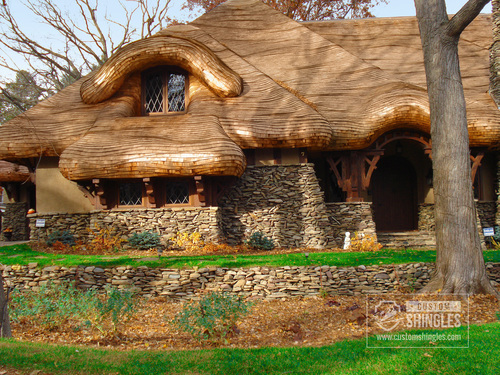 Timelessness: Due to their organic material and the fact that they've been around for centuries, Cotswold shingles give homes a timelessness that is often lacking in homes of more modern and conventional design. For example, most houses built across the U.S. since the post-WWII suburban boom have been too plain to merit landmark status. Houses roofed with Cotswold shingles are more likely to be valued and maintained for generations to come. Sophistication: Another attraction of Cotswold, Carmel and Hugh Comstock roof designs is the highbrow factor. As an Old World style, Cotswold roofing provides a touch of sophistication to any home. Regardless of the initial value of the home itself, the addition of Cotswold shingles can lend any home a level of prestige much higher than that of neighboring properties. Houses that sport antique, Old World roofing styles have an overall reputation as being higher class. Durability: Another key benefit of Cotswold shingles is their durability. Comprised of layer upon layer of treated wood, Cotswold roofs are thicker and therefore stronger than most other roofing options. In the literal sense, the blanket-like thickness of Cotswold shingles really does serve as a barrier against decades of downpour, snow, hail, wind and other strong elements. Market value: Thanks to their visual charm, uniqueness, timelessness, sophistication and strength, Cotswold windows add market value to homes of all sizes. Whether the property in question is a mansion or a basic two-bedroom home, the addition of a Cotswold roof can make that property skyrocket in value. Longevity: A Cotswold, Carmel or Hugh Comstock roof can be a sizeable investment, but it generally pays back in spades when you consider the durability, longevity and increased market value that accompany such roofing choices. By contrast, cheaper roofing options like asphalt require more maintenance. A Cotswold or Carmel cottage roof contractor can arrange for an installation of shingles in these styles on practically any type of home. Regardless of whether a house is single-floor or multistory, compact or spread out, the roof can be transformed with a Cotswold or Carmel-style roof design. Insulation: One of the main reasons to have a Cotswold or Carmel cottage roof installation performed on your home is the improved insulation quality that comes with such roofing. Houses equipped with Cotswold shingles tend to insulate temperatures better because of the strength and thickness of the wood, which blocks the passage of air between the inside and outside. As such, homes can conserve energy with Cotswold roofing. Winter warmth: Another reason to have cottage roofing installed is the heightened protection Cotswold shingles provide against the environmental factors of winter. In homes equipped with asphalt roofing, the heat produced by an HVAC system often leaks through cracks in the roof. The treated wood of Cotswold is far less liable to break under stress in times of hostile weather, even after many winters of harsh winds and heavy hail. Summer coolness: The strength of cottage roofs can also help homes save on cooling costs during summer months. With no air passing between the attic and the sky above, the coolness generated by your air conditioner goes to better use. This can help you save on your electrical bills during the often humid weeks of late June through early September, when vast amounts of energy go to waste in the majority of homes with asphalt roofing. Low maintenance: Another benefit homeowners love about country cottage roofing is the minimal amount of maintenance required to keep such shingles in optimal shape. Because Cotswold shingles are made of wood — an organic material that has thrived in nature for eons — roofing of this type is naturally suited for decades of exposure. Trade up: When your existing roof needs to be replaced, one of the best things about a Cotswold roofing installation is how the shingles can transform your home. The striking uniqueness of Cotswold can greatly enhance the visual appeal of your home, which can boost the overall value of your property. A cottage roof installation is a huge trade up from most other roofing options. Added value: The additional value houses typically gain after Cotswold roofing installations is a massive asset. A house that would otherwise sit vacant with a "for sale" sign in the front yard for months on end is more liable to be snapped up in a heartbeat with a classy, eye-fetching feature like Cotswold shingles. Whether or not you plan to sell your home in the foreseeable future, cottage roofing could be a boon to its market value when the time finally comes. English country cottages are roofed with only the finest wood shingles, which are cut from the strongest and freshest timbers. The cultivation of Cotswold consists of a dedicated process that has made this style one of the most durable types of roofing on both sides of the Atlantic for generations. At Custom Shingles, the materials for each roofing project undergo the following processes. Handcrafted: Cotswold cottage roof shingles are handcrafted from fresh timber. The individual care that goes into the cutting of each shingle is crucial to the unique appearance of this roofing style. Any glance across a finished Cotswold roof shows tons of unique, wavy lines, much like sketches of cottages in a children's book. These lines help give the Cotswold style and impressionistic flavor that makes such roofing stand out from all other options. Steam-bent: Each Cotswold shingle is steam-bent, and this process gives the wood its wavy, slightly warped-looking shapes. When applied layer upon layer over the eaves of rooftops and gables, steam-bent shingles give off a puffy appearance that is key to the animated charms of this roofing style. Individually installed: Skilled installers apply each Cotswold shingle separately by hand to ensure the process of roof installation is carried out with consummate skill and sensitivity to detail. As a new English cottage roof takes shape, the intended puffy appearance of the roof gradually becomes apparent. The uniqueness of Cotswold is all thanks to the care that goes into the cultivation and installation of the shingles. Regardless of the type of home you currently own, you could transform it into the English country home of your dreams with the application of Cotswold, Carmel or Hugh Comstock cottage roofing. An English cottage roof contractor can look at your property and share options that could have your house become the most admired and talked-about home in town. For more than half a century, Custom Shingles has been one of the most unique names in the roofing business. 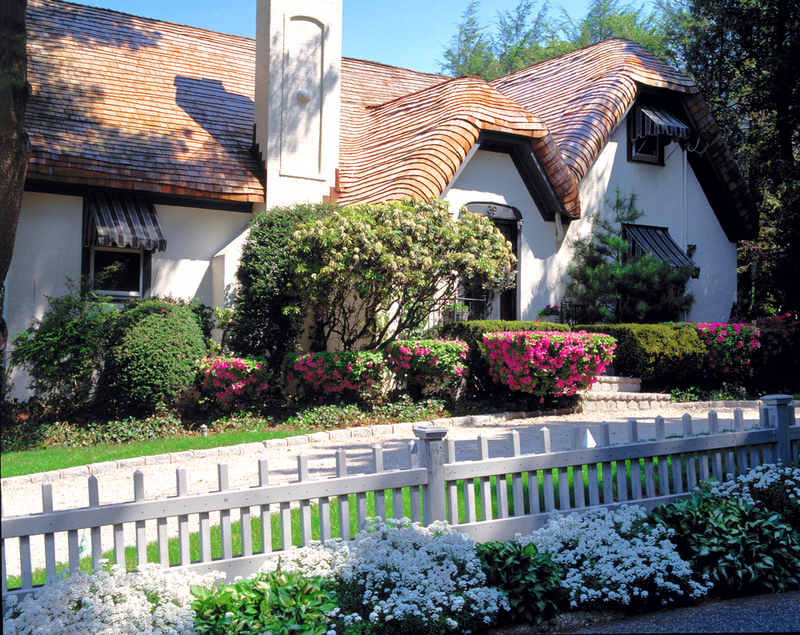 With our many installations of Cotswold roofs, we have been responsible for some of the most distinctive residential facades in the United States. If you are in the market for a new and different roof on your house, review our roofing capabilities and call us for a quote today.